The departement of the Alpes Maritimes - Pop. : 180 h.
from Nice, take the RN 202, in the direction of Digne then the D28 on the right after Touët sur Var. 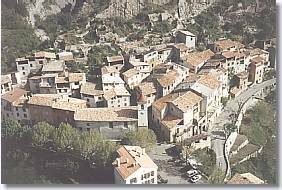 Rigaud is a small hill top village looking over the Cians gorge. In ancient times (1247), it was the headquarters of the former knights and the most important in the area. The former chateau is now in ruins. In the village itself, let yourself be led by the small flower lined, paved streets, discover the vaulted passageways, medieval houses as well as a beautiful series of ancient doorways with with sculptured lintels from different epochs. Lieuche (8km), Touët sur Var (10km), Pierlas (11km).